Several elected governors and state lawmakers have been presented Certificate of Return by the Independent National Electoral Commission (INEC). 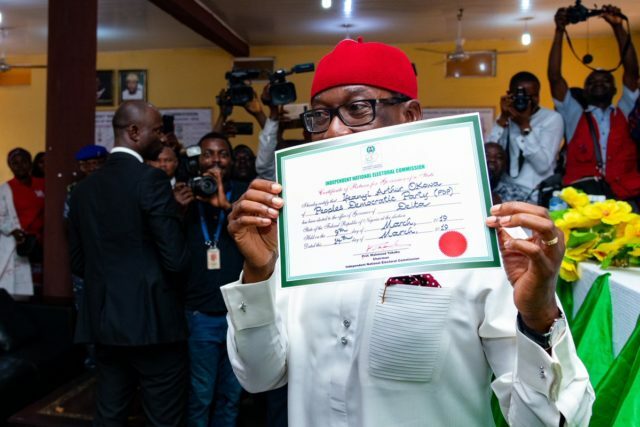 Delta State Governor-elect Ifeanyi Okowa alongside his deputy, Kingsley Otuaro were issued their Certificate of Return by the National Commissioner of INEC, Dr Mohammed Lecky, at INEC office in Delta State on Wednesday. Okowa commended Deltans, INEC and the security agencies for their roles in the success of the elections. He also sympathised with the families of those who lost their lives during the election. He urged INEC to stay committed to growing Nigeria’s democracy and improving the way elections are done. “There is room for growth in our democracy, we must conduct elections in such a manner that will be appreciated by the world as such will boost the confidence of the people and attract investors to our country, politicians should realise that election is noble and should go out and campaign for votes and ensure that elections are devoid of avoidable deaths” Okowa said. Professor Babagana Zulum of Borno State was also issued his Certificate of Return by INEC at a ceremony in Maiduguri, the state capital. The governor-elect in his remarks promised to tackle the root cause of the insurgency that has ravaged the state. Governor Bello of the All Progressives Congress enjoined members of the opposition in the Peoples Democratic Party (PDP) to join him in moving the Niger state forward.